I can’t say Aladdin is my favourite Disney animated feature, but I’ve had the card since 1994, when I was a student in Paris. I say “in Paris”, but really it was in Orsay, beyond even the suburbs of Paris, the furthest distant branch of the Université de Paris. 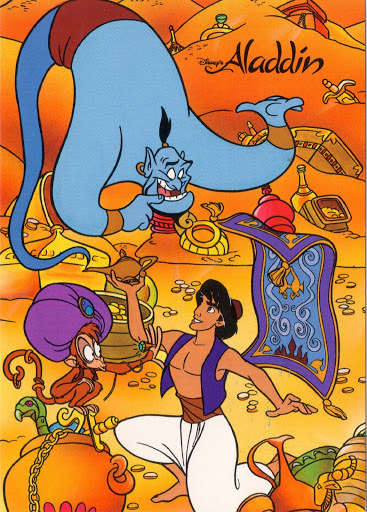 I went to see Aladdin dubbed into French, and although everyone laughed uproariously at everything the genie said, I couldn’t make heads or tails of it. Still, I enjoyed the songs.. je peux t’ouvrir les yeux. A couple of weeks later I went to see it in version originale in a gorgeous Parisian cinema (wish I could remember which one), with a full live song-and-dance beforehand, much like the ones at El Capitan in Hollywood. It was a good evening. 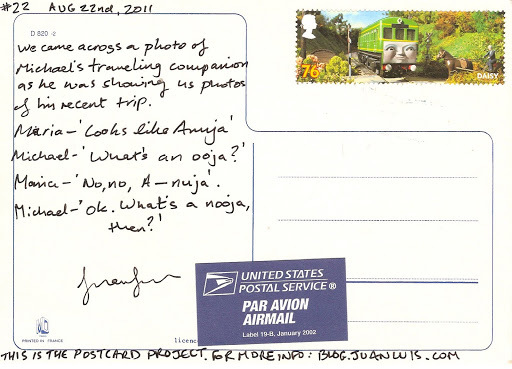 What’s written on the card came out of a conversation we were having over the weekend with our visiting friend Michael, and who better to send it to than the An-ooja in question! I found the card and she used to work at Disney; it’s like the planets aligned for this one.